“In our last episode…” almost seems a fitting opening! After all, a story that includes knights, troubadours, a drum corp, and mysterious men in dark cloaks does have an epic ring to it. Built by the Sienese in the 1200’s, this small garrison had the sole purpose of defense, mainly against those pesky Florentines and Volterrans. Amazingly so, the original walls still encircle a place that hasn’tmuch changed in the past 800 years, which is precisely one of the major appeals for me. 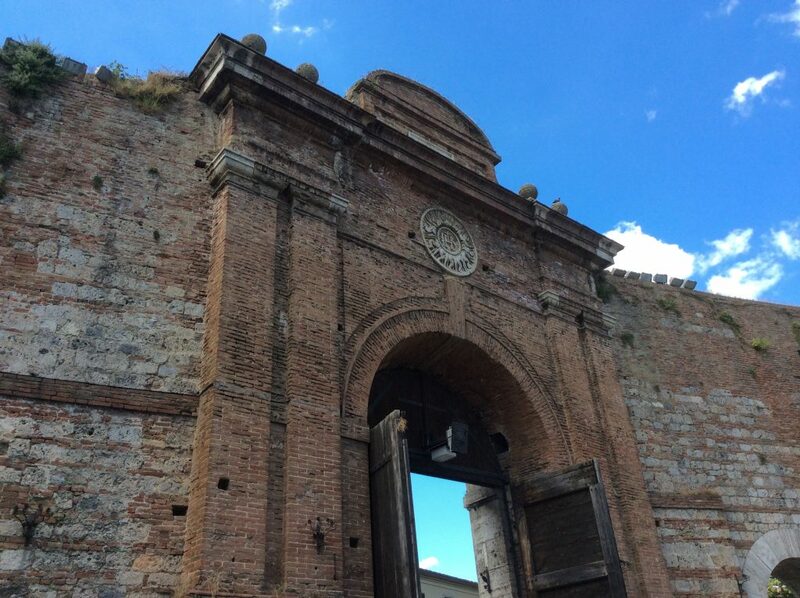 The main entrance, at least for today’s visitor, is through the north gate, the Porta de San Giovanni, that faces Florence. 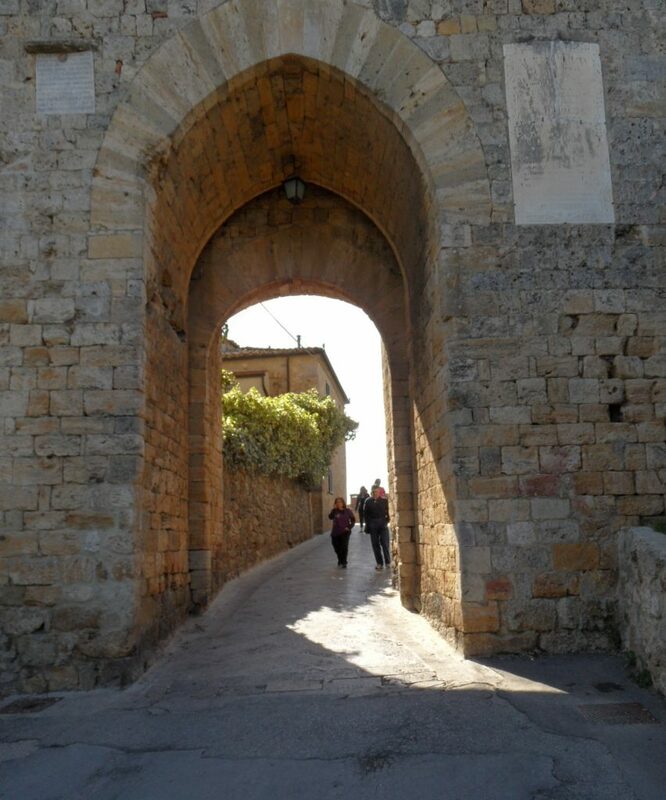 At the opposite end of the mostly straight main street is the south gate, the Porta Franca, thus named as it fronts the Via Francigena. 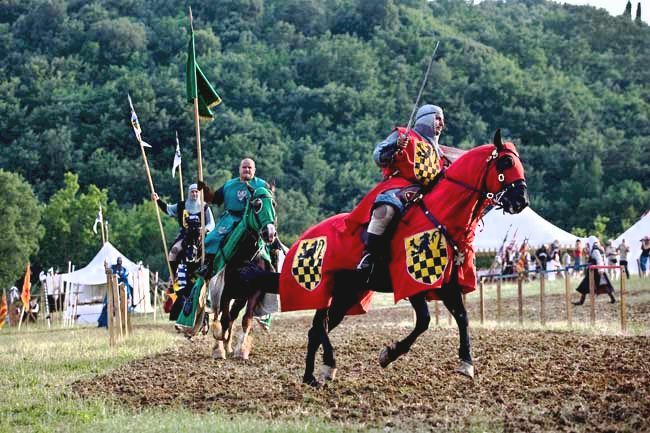 The town offers a handful of good restaurants, a nice selection of overnight accommodations including a Pilgrims’ hostel, enough shops to satisfy, the rustic Church of Santa Maria Assunta, and an Armor Museum that allows your “inner knight” to have a little fun with try-on armor and weapons (yes – I did). 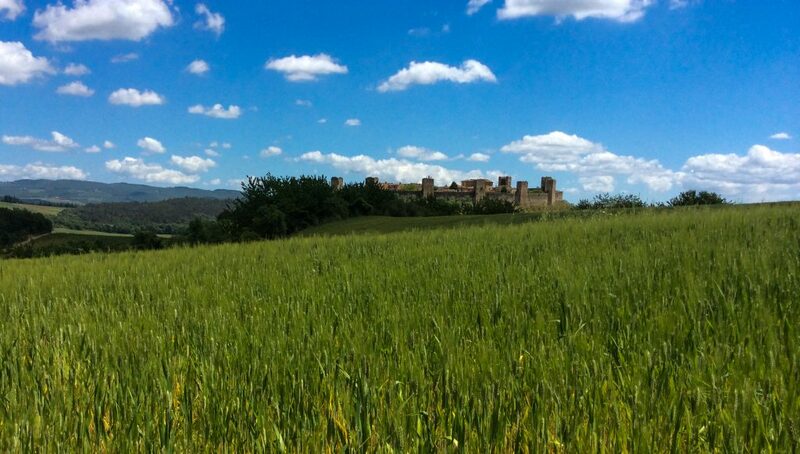 And if you want to get a feel for what those ancient guards saw while on duty, pay a small fee and explore the top of Monteriggioni’s walls. The views alone are worth a million euro. 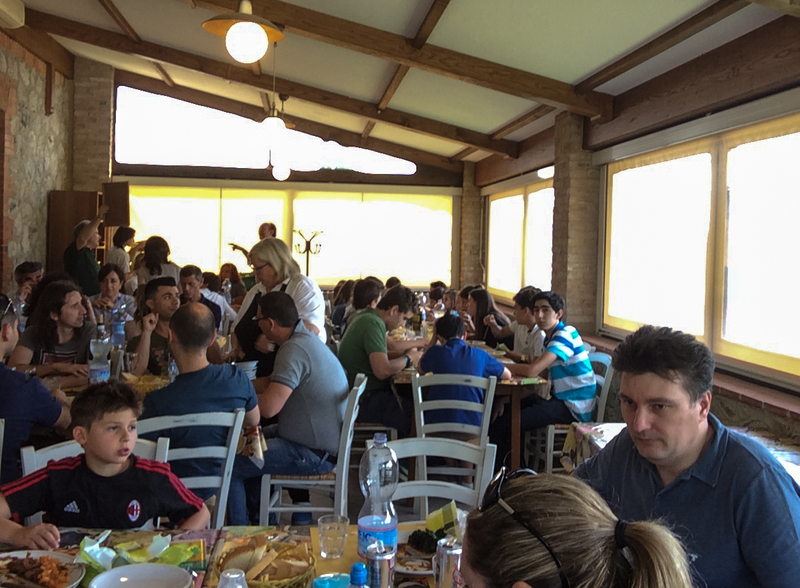 Appetites whetted by our morning hike, lunch was arranged at an incredible little trattoria near Racciano — the livelyIl Ceppo — located precisely on the ancient Via Francigena. Fittingly so, the final leg of our cultural route along the spa towns of Tuscany onto the pathways of pilgrims and the Via Francigena found us at the gates of the magnificent russet city, the pellegrini’s “Oz”, the culmination of culture, beneficent government, and interlude before Rome…the jewel called Siena. 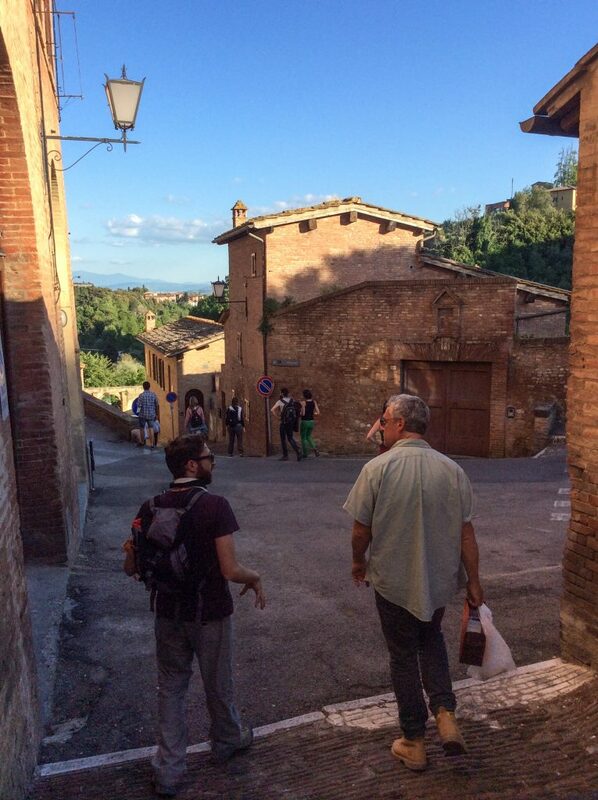 Entering through the stately north gate, Porto Camollia, just as the pilgrims would have done, we began an afternoon reenactment of sorts as we followed the venerable pathway leading to Siena’s spiritual epicenter. The Chiesa di San Pietro Alla Magione, a short distance from the gate, solemnly greeted us with her understated Romanesque profile. 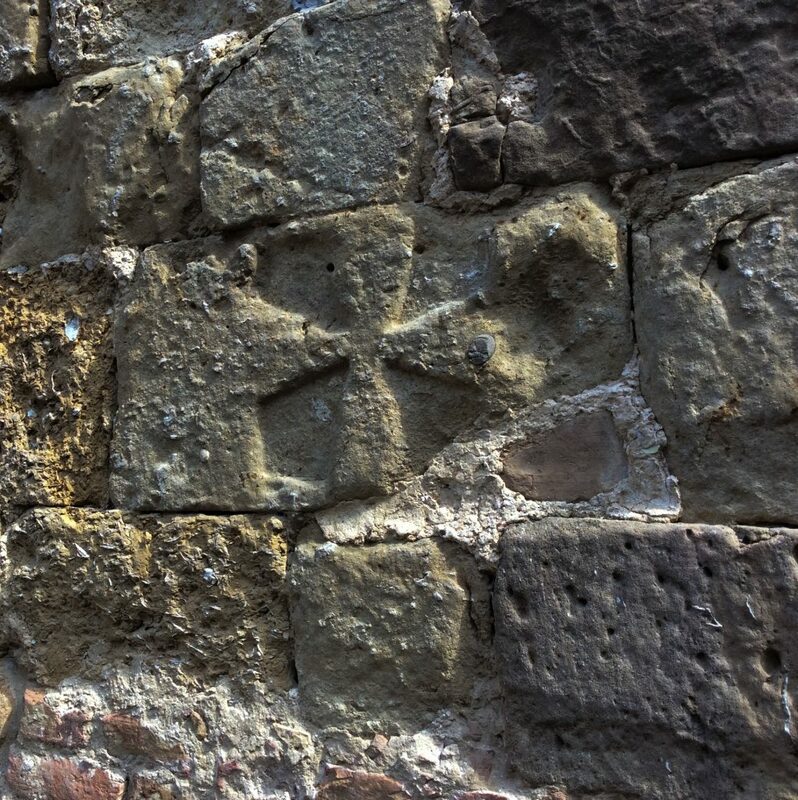 Originating around 998, this church was a designated “magione”, or hospice, for pilgrims and run by the Knights Templar, later passing into the hands of the Knights of Malta. 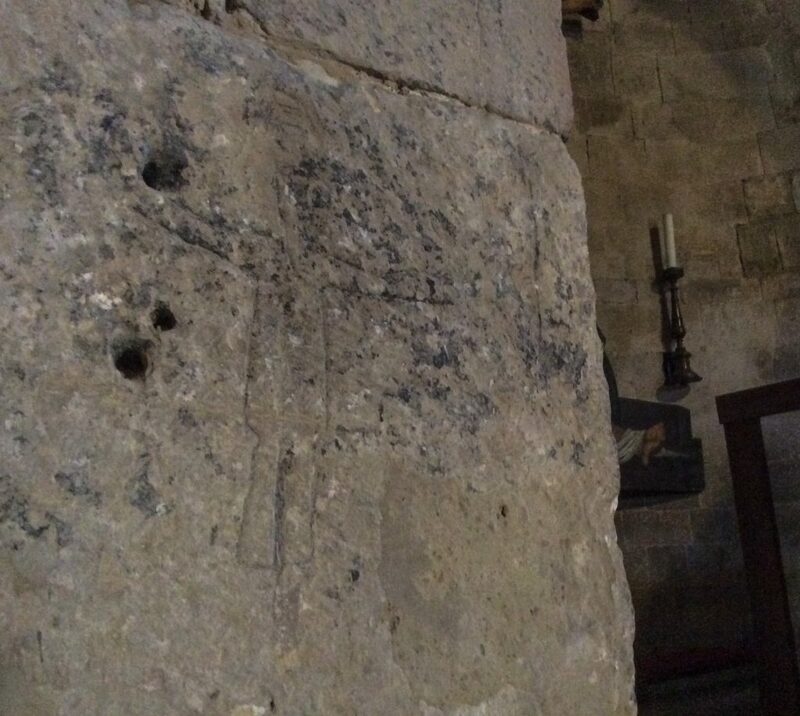 Interestingly, there is ancient graffiti adorning this building — carvings in stone on the outer left wall of various Templar crosses, and inside near the alter a carved crucifix type figure; a symbol of the pilgrim. 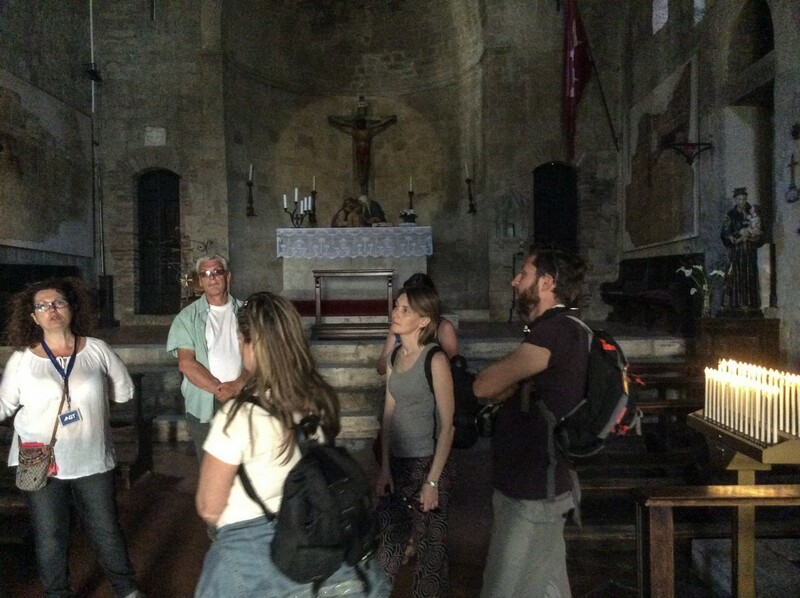 The interior of the chiesa is stark; worn terra cotta tiles cloak the floor, a darkened beam ceiling resides overhead, rustic wooden pews stand at attention, and the bare stone walls are dotted with only a few works of art. I found this even more intriguing, moving, than a baroque wonderland of a church dripping in ornateness. We beheld what had been the first sacred sight to untold numbers of worn and weary land voyagers along the Via Fracigena; a sight basically unchanged for a thousand years. I ran my fingers across an centuries old iron candleholder and marveled. 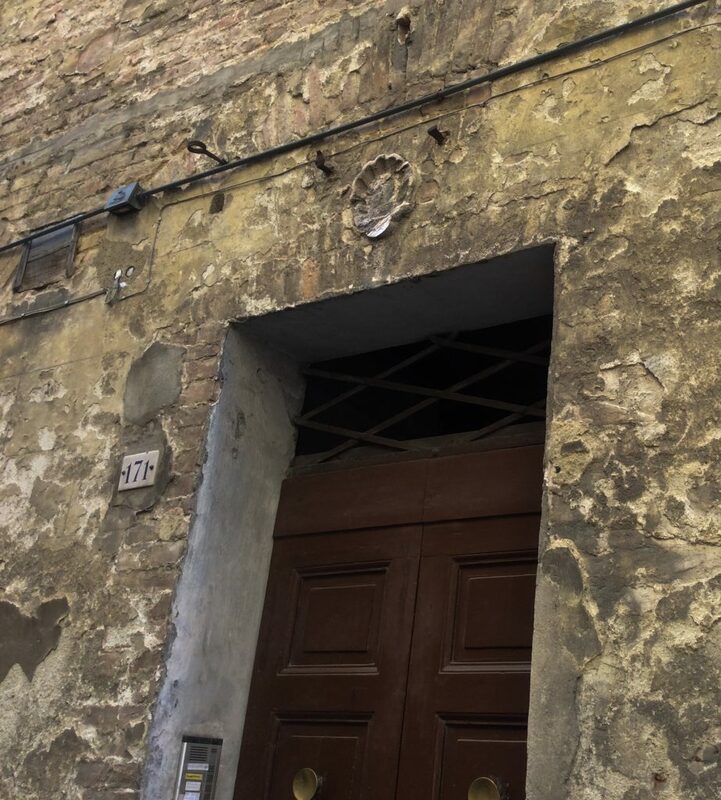 As we moved down the Via Camollia, our guide pointed out another image well-known to visiting pilgrims — the scalloped shell. 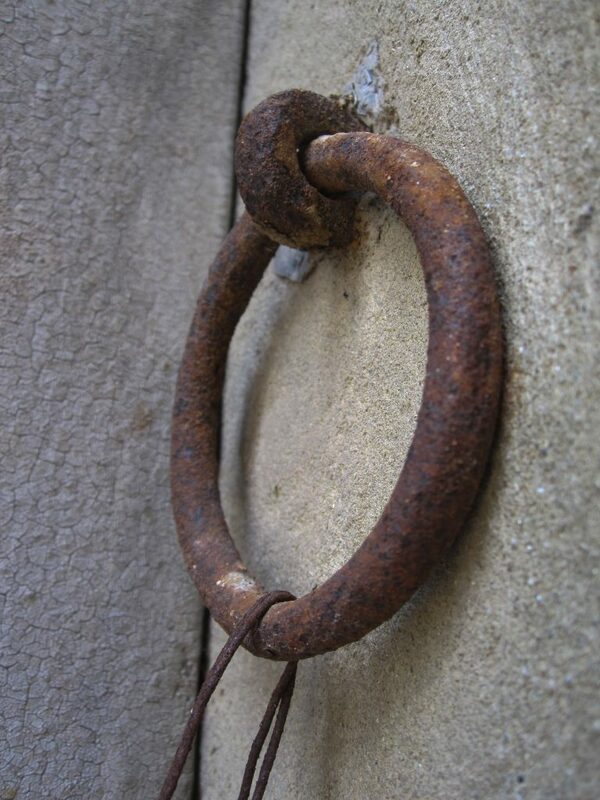 Holding many facets of symbolic significance, the meaning implied here was of welcome and hospitality to the pilgrim when found over a doorway. 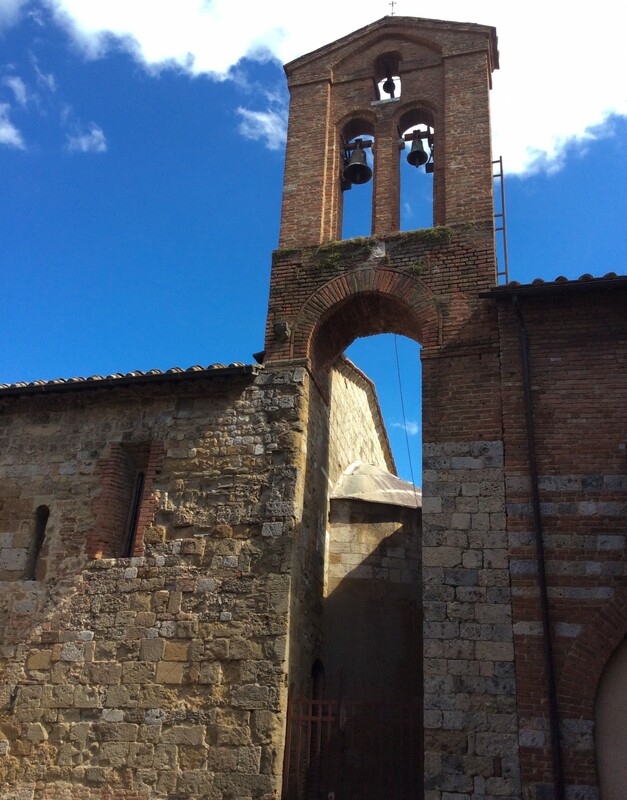 Another interesting note regarding Chiesa di San Pietro is the bell tower found in the rear courtyard. Of the open style more typically found in the countryside due to its ability to be heard at further distances, this design was also a sign to the pilgrim of a dedicated hospice. 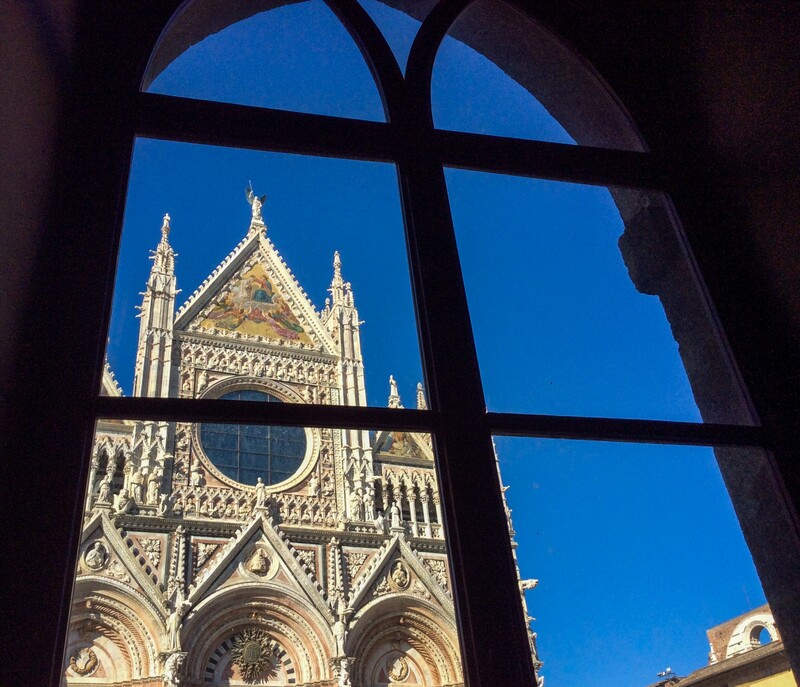 Currently, there are 12 active pilgrim hostels in Siena, as well as an organized weekly urban trek for those wishing to retrace the route in Siena. 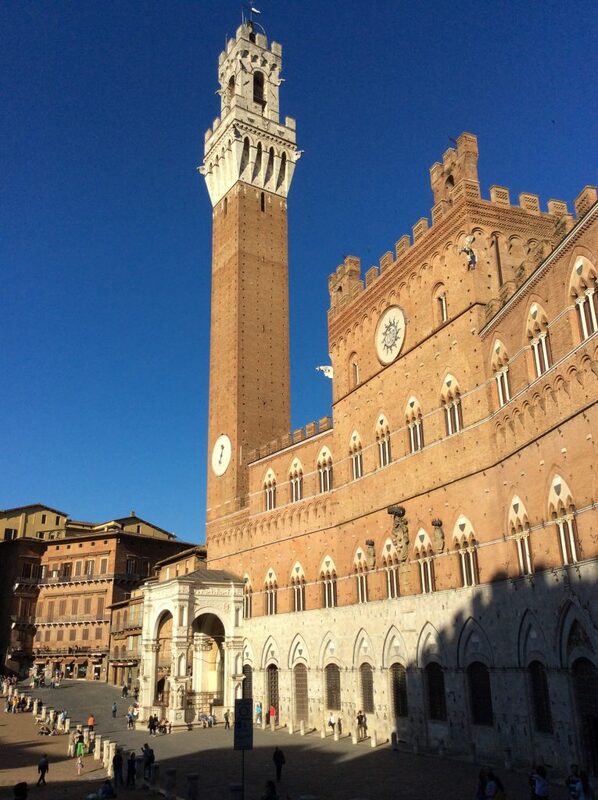 Our entourage moved further into the heart of Siena. Loosely crowded streets now became busy with a hub-bub of tourists, shoppers, and residents. 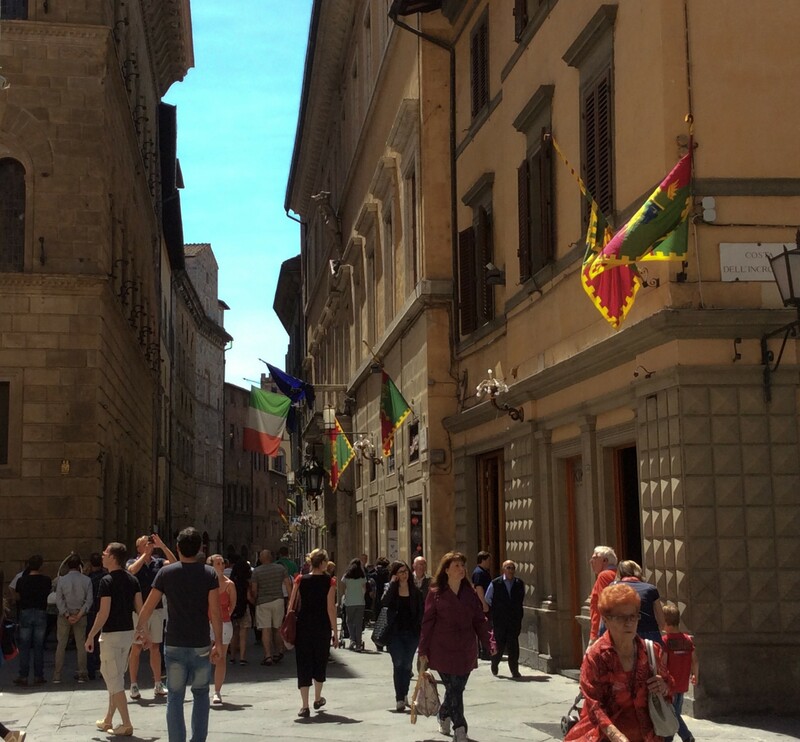 Bright red and green flags, the banner of the contrada Drago (one of 17 distinct neighborhoods in Siena that fiercely “battle” during the two Palio horse races held each year) now waving to commemorate upcoming celebration, hung overhead adding a festive feel to the concourse. Is this a similar scene that would’ve greeted the bewildered pilgrim? Bewildered or not, there is no doubt that the pilgrim…or any visitor past, present, future…would segue to an instant feeling of astonishment and awe as he/she rounded the corner on the Via Città Banchi and gained first glimpse of the spire of the grand bell tower “Torre del Mangia” in Piazza Del Campo. It’s ruddy red contrasted against a dazzling blue sky evokes an almost mystical feel that surely enchanted then as it does now. But this wasn’t the only heart-stopping sight to behold. 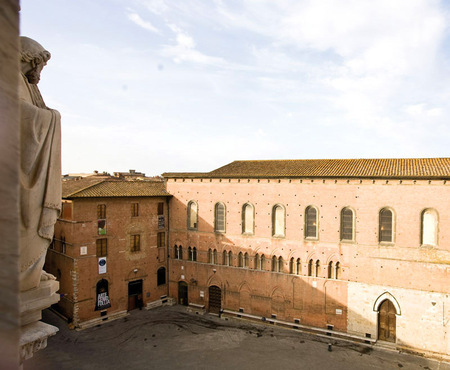 We turned right to follow the Via delle Pellegrini, a direct pathway to Siena’s crown jewel, the Cattedrale di Santa Maria Assunta. Unquestionably, this gothic queen was designed to impress, both inside and out, and it carries the task off quite magnificently. 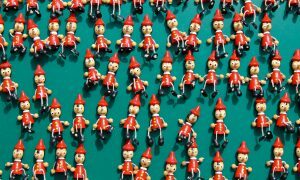 One can only imagine what thoughts raced through a road-beaten pilgrim’s mind, especially when taken into consideration that, unlike today’s rather new model of traveler/pilgrim, the pilgrim of old was generally from a rural, hard life of sustenance. 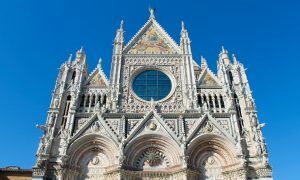 To behold this sparkling marble and granite, mosaic encrusted behemoth must’ve seemed more of an arrival at Heaven’s gothic gate than at the duomo of Siena. With no time to venture inside (which I would highly recommend to make time for on your travels — the opulent “illustrated Bible” floor is one of many stunning sights), we crossed the piazza to the entrance of Santa Maria della Scala, so called because of its proximity to the steps (scala) of the Duomo. This hospital-turned-museum opened its doors sometime around 1090, and continuously served for one thousand years. A dedicated ospedale, a place of hospitality specifically for pilgrims traveling the Via Francigena, the hospital evolved into a model of social service taking in abandoned babies, feeding the poor 3 times a week, outfitting pilgrims with food vouchers and a little cash, and seeking to actually cure the sick in sanitary conditions (somewhat of a novel idea in earlier times). 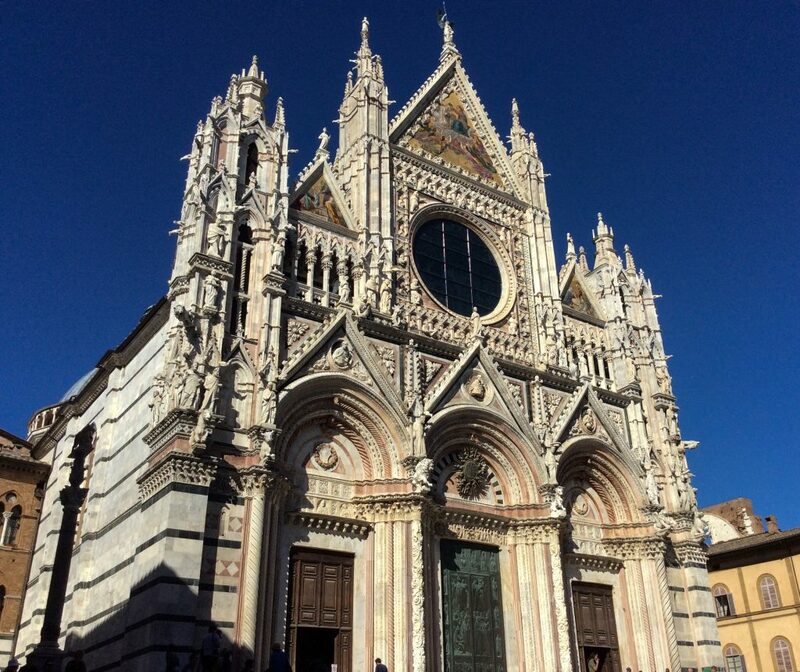 If fine art procured health, Santa Maria della Scala would have a 100% cure rate. 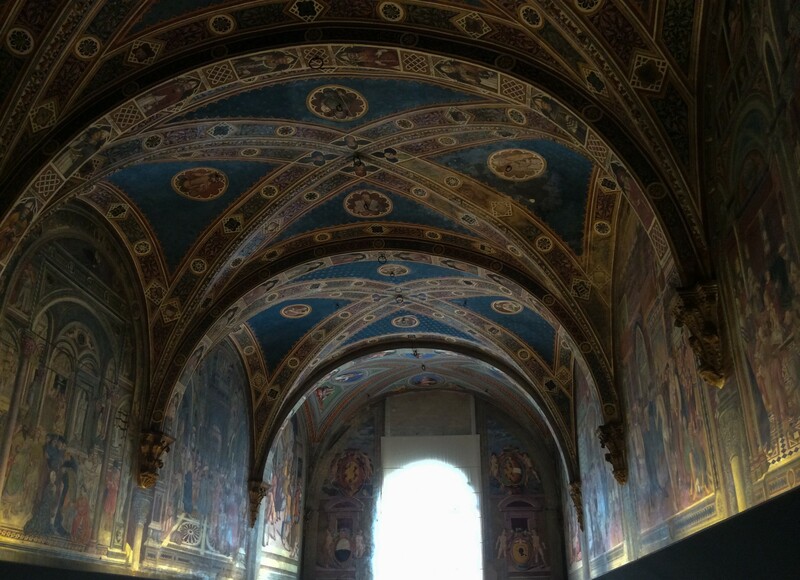 Funded by nobles and the wealthy, money existed for an extensive array of incredible frescoes, architecture, and a dramatic chapel. 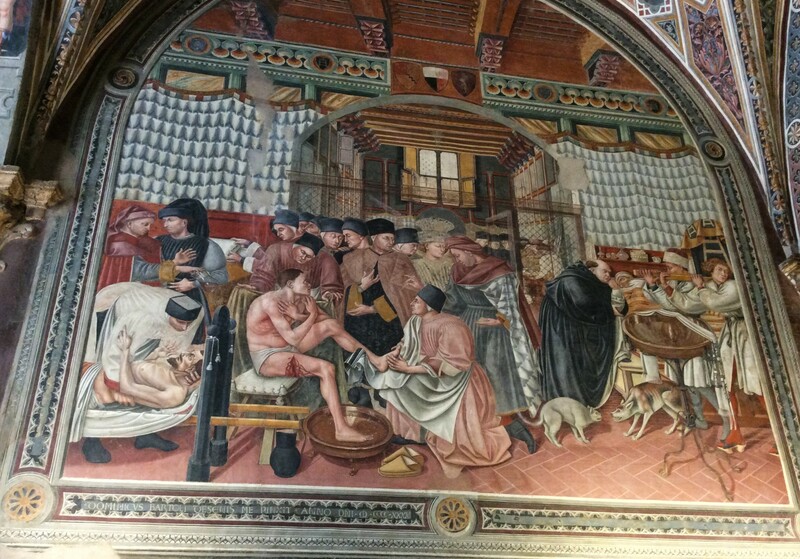 The entry level main hall known as The Pellegrinaio, or Pilgrim’s Hall, features a striking cycle of frescoes heralding the hospital’s history. Realizing the extent of this treasure, there was an outcry in the 1960’s to discontinue hospital services and restore the complex to its place as a venerated museum. This culminated in 1995 when the Scala was first opened to visitors, and the restoration and growth as a museum continues. 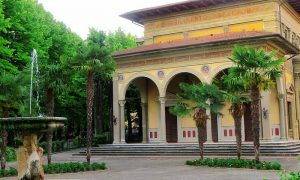 The ability to view the vast, ornate halls is worthwhile in itself, but in its established altruistic style, the Scala also affords an impressive lower level of Etruscan relics, actual relics (as in fingers, thyroids, or what have you), and the original remains of Fontana Gaia, the famous Fountain of Joy, by Jacopo della Quercia. 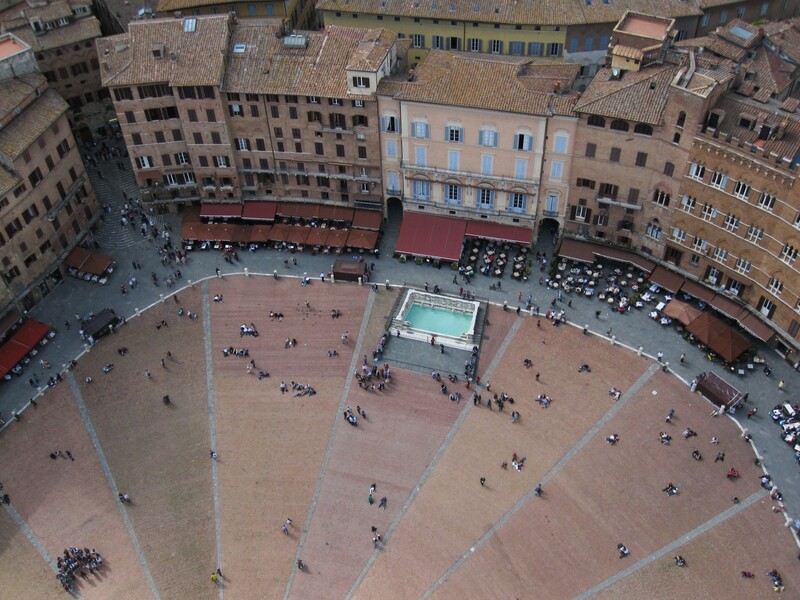 The current fountain that crowns the Piazza del Campo is a replica, albeit most admirable and enjoyable — just ask the pigeons. 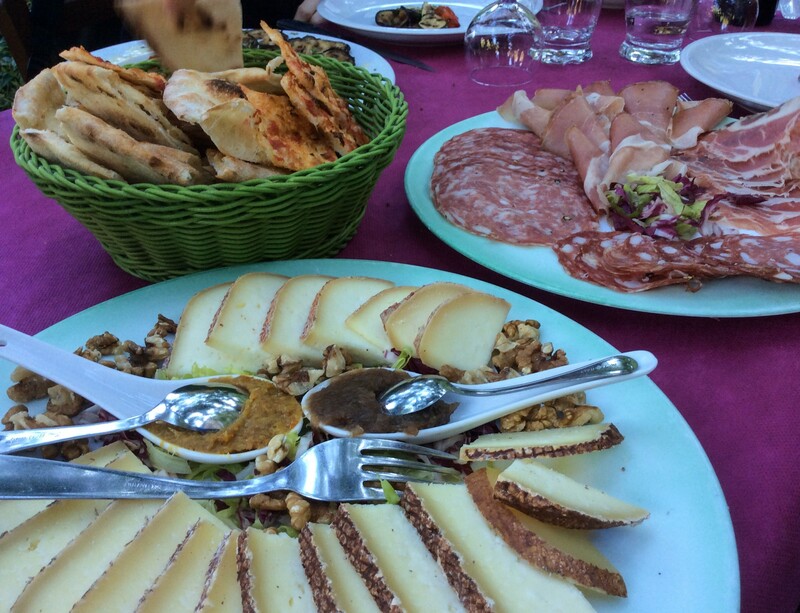 Feeling quite joyous ourselves, we began a leisurely walk from Santa Maria della Scala to our evening destination for our final meal together. 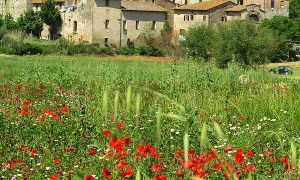 Merging from the narrowed walkways south of Piazza del Campo, we came upon an open air path that gave way to what seemed almost countryside: green meadow, fruit trees, wide sky, a lush vegetable garden. 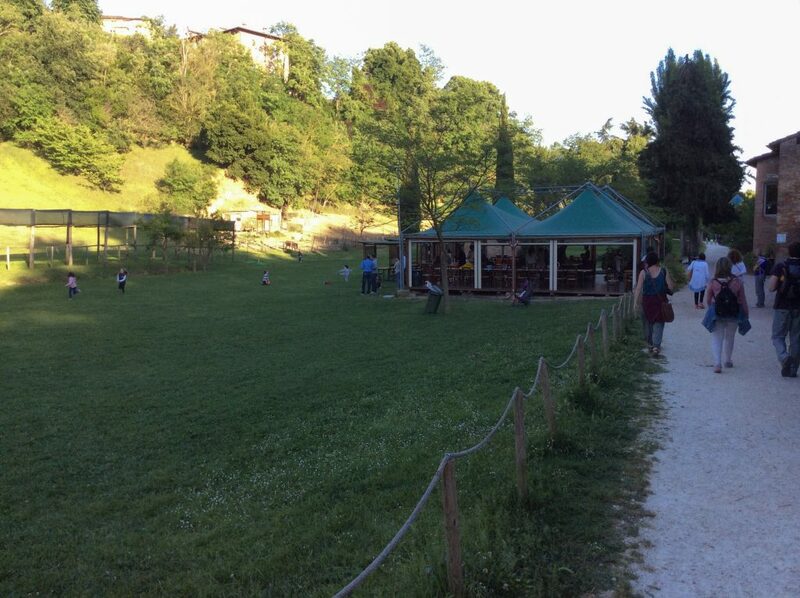 In the open space there appeared to be some sort of park; children ran and played, adults laughed and sipped wine, a long stall held an array of small animals. All this, yet we were still well within the urban old town of Siena. 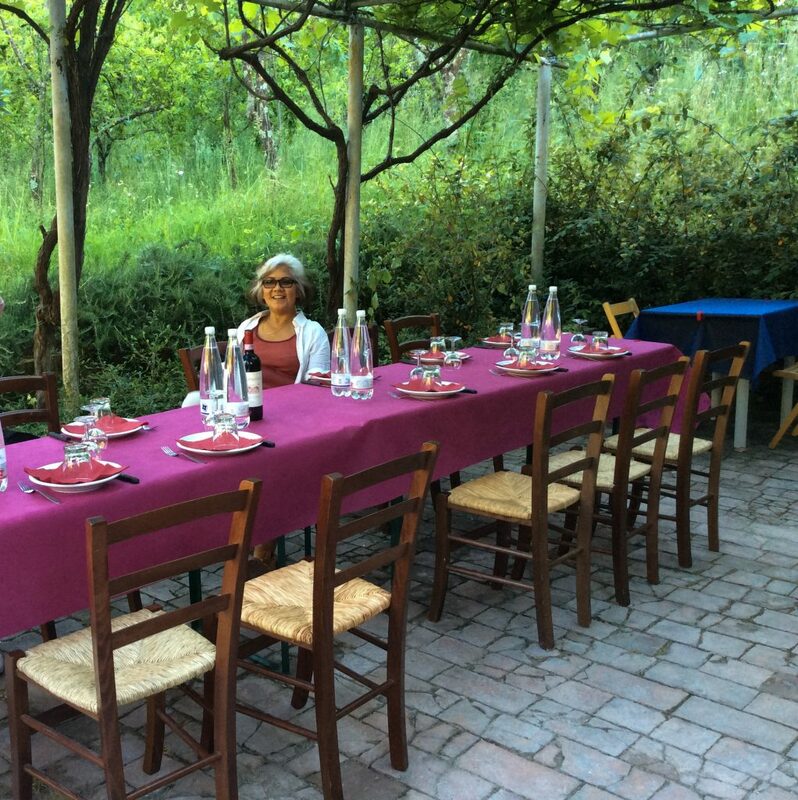 Called Orta de’ Pecci (Garden of Spruces) this pleasant space offers picnicking, wonderful meals at the humble ristorante, and a family friendly place to lull away a few hours…or a day. 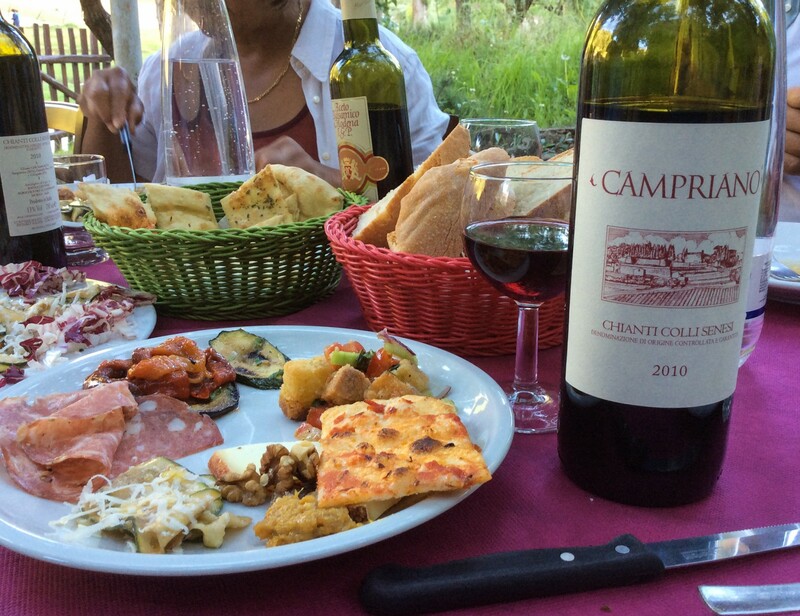 We were fortunate enough to lull our way through a grand selection of apertivi including various cheese and meat selections, seasoned foccacio, grilled vegetables, and other assorted Tuscan fare, along with plenty of Chianti to wash it down. However, there were many unseen layers to this serene oasis. It’s infamous past included having been a center of the city wiped out by plague in the 1300’s; next it served as the last grounds walked by condemned prisoners on their way to execution; top that off with its role as part of a dark mental asylum in the days before humane treatment, and well…let’s just say there is redemption to be found, regardless of ones past! 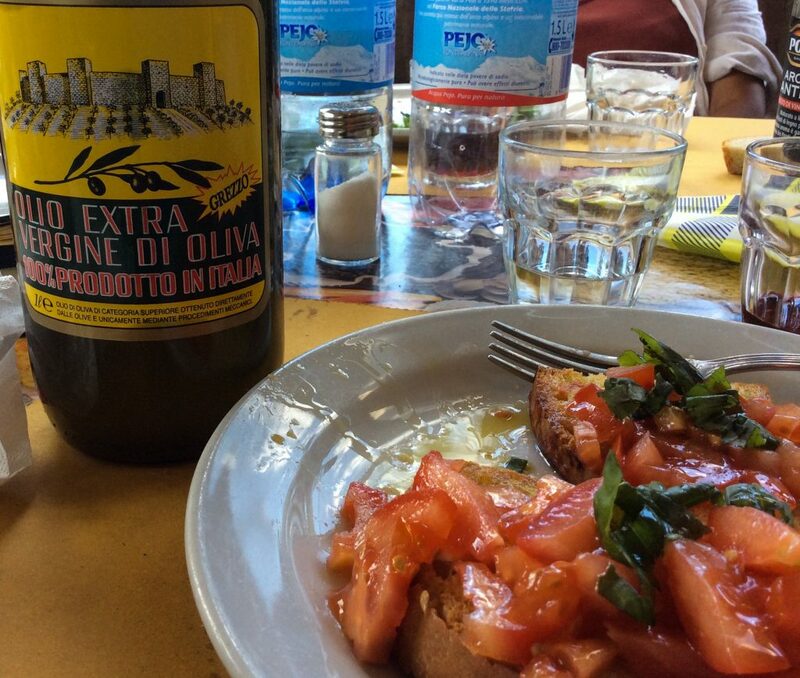 And redeemed the Orta de’ Pecci is. In addition to the aforementioned points, I also learned that the staff for the entire complex is managed by an operation known as La Proposta, an entity that offers employment and redemption (how fitting) to those who’ve had difficulty in life, be it addiction, physical handicap, mental illness, or just hard times. There are no enchanted plants, or mysterious essences used to make poisonous potions (that’s not strictly true: there is some mandrake); no overheated knights in search of the Holy Grail rest there during the day and no elves populate it by night. 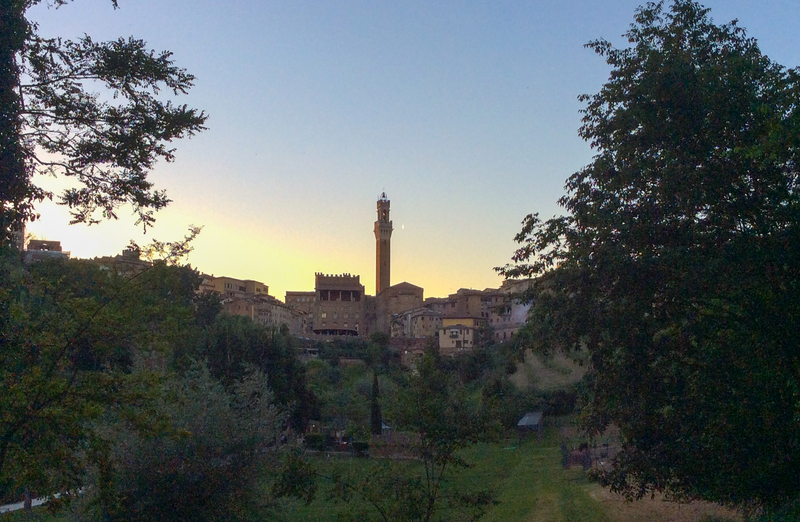 Siena’s medieval garden isn’t home to verbena, but there are plenty of lettuces, cabbages, turnips and onions, which were part of the everyday diet of every social class. (Basically, Lancelot would really have needed to brush with some very strong mint toothpaste before kissing Guinevere). Orta de’ Pecci continues in the pay-it-forward mode by offering their Educational Farm project, a program designed to give small children the opportunity to partake and interact with gardening, animals, and the joys of nature, as well as experience storytelling via “gnomes and elves” who share lessons in respect and care for the gifts of nature. If the delight of sitting under vine-wrapped trellis while indulging in simple and delicious Tuscan rustic fare didn’t thrill me enough (which it did), discovering the rich heritage being established by this place truly added value to value. 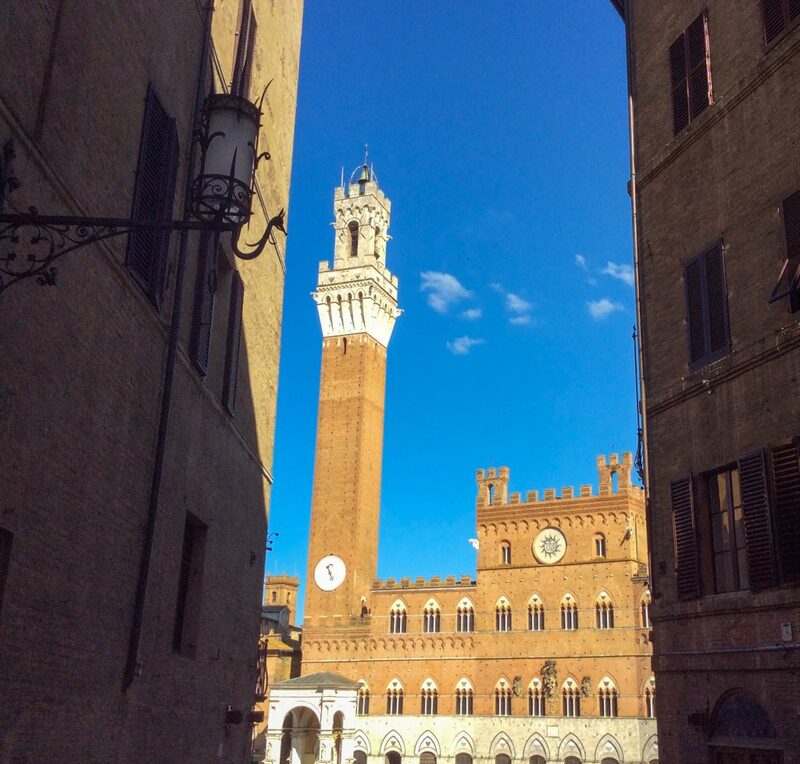 A chill took over the warmed spring air as the sun lowered over Siena. 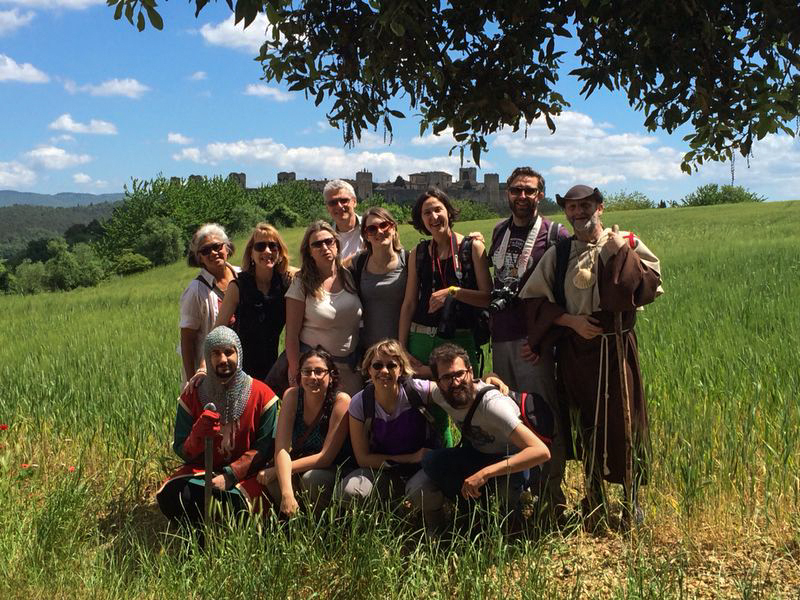 Knowing this was our last time together – a band of modern pilgrims sharing a short but remarkable journey of history, culture, food, tradition, exploration, and discovery – I felt an overwhelming sense of gratitude and good fortune for having been a part of this. I also felt more than a tinge of sadness at the upcoming departure from this new group of wonderful friends; people who less than a week ago had been mere strangers, and now were an indelible part of my life and memories. A pilgrimage was indeed executed on this four and a half day journey, and my soul was rich with discovery and blessings, redemption and renewal. …and one lucky gal from Kerrville, Texas — me! And of course, a HUGE GRAZIE MILLE to each and everyone of the restaurant and hotel owners and staff, the various tour guides and drivers, the establishments we visited, the proud citizens of each town, and each and every smiling face encountered that all added up to the sum total of one incredible, unforgettable journey. 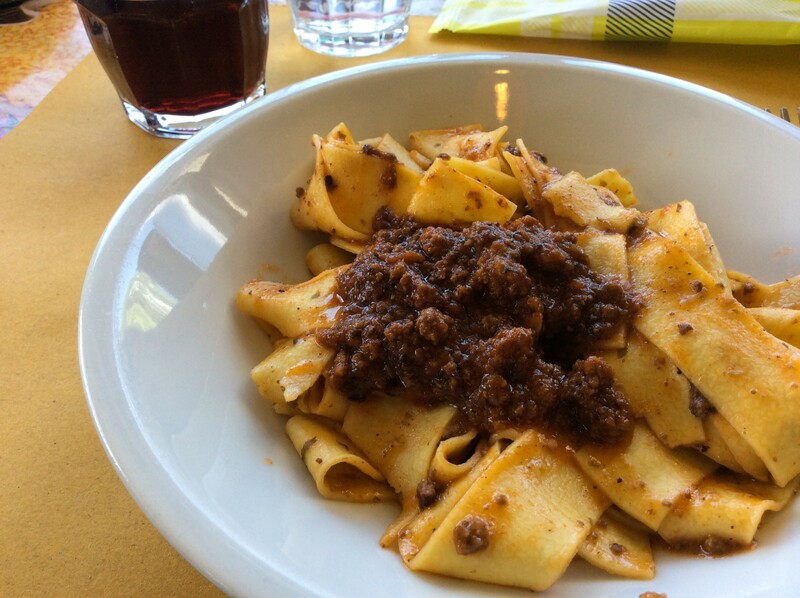 Baci e abbracci a voi!